Though this is truly a magical season, Holiday Hazards lurk everywhere. Pay attention to potentially-dangerous items and situations that are most prevalent during the holidays. Naturally, you want to share a treat and perhaps people food with your four-legged friends during this festive time of year. Be careful: rich foods can cause at the very-least gastrointestinal issues but could lead to the very-painful pancreatitis. Some signs of a problem include vomiting, restlessness, shaking, fever, and diarrhea. See a vet immediately. Every year, the beautiful poinsettia gets a bad rap. While poinsettia plants do contain a sap that can irritate your pet’s mouth and potentially cause vomiting and diarrhea, the harm of Poinsettias is often exaggerated. If you suspect your dog or cat has ingested poinsettia, take away the food and water to give their stomach a break for a bit. You should be more concerned about mistletoe and holly toxicity. While your pet would have to consume a lot of mistletoe to be harmed, it can cause difficulty breathing, low blood pressure, and peculiar behavior. Holly is not quite as dangerous, but the leaves and berries can cause vomiting, lethargy, and excessive drooling. Watch out for fallen tinsel and decorations with small parts that could be ingested by dogs or cats. Tinsel, ribbon, and things like string can cause severe stomach and intestinal damage, not to mention, great pain. Don’t forget that pets can become stressed-out, just like people do; the holidays can be stressful! Some dogs or cats may instinctively want to flee when there are noises, chaos, or people at your home during the holidays, so keep an eye on the door. It helps to put pets in a comfortable, quiet room of the house where you can contain them until the activity dies down. Chocolate is toxic, often deadly for dogs. It can cause seizures and liver failure; if you suspect your dog has consumed chocolate, take them to the emergency vet, pronto. Dogs can die from alcohol toxicity, often slipping into a coma first. Some signs that they may have gotten into your holiday spirits are lethargy, clumsiness, vomiting, nausea, and in more extreme cases, tremors, seizures, and difficulty breathing. Be concerned with what may be mixed in the drink that your pet consumed, such as nuts, chocolate, or essential oils, that could pose harm on their own. Make sure to keep your drinks and holiday spirits covered tightly and out-of-reach from curious pets. The pretty packaging and gift wrap of the holidays poses a serious risk of choking for dogs and cats. Keep wrap, bows, and ribbon out of reach of pets, and consider keeping gifts wrapped simply to deter pets from being drawn to the packages. Also, keep trash cans covered to prevent pets from finding dangerous packaging inside. 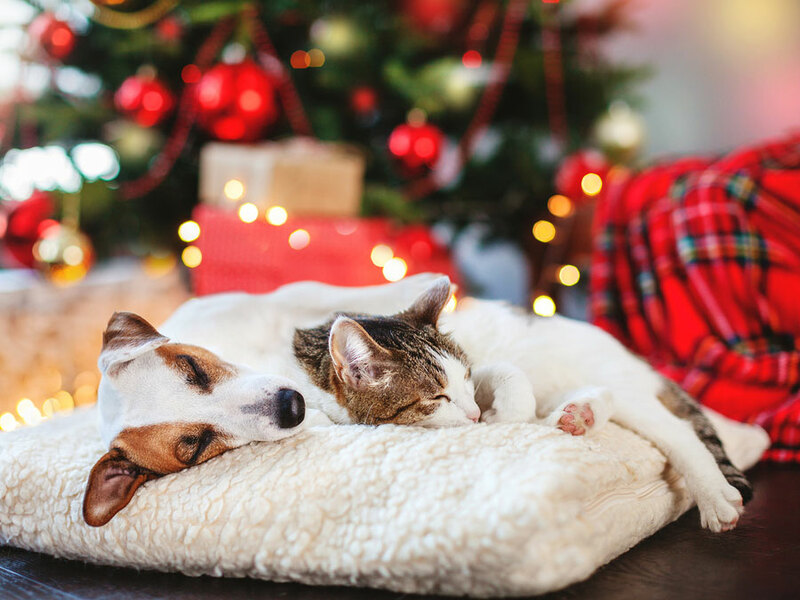 Has your pet fallen prey to these holiday hazards? Take them to an Emergency Vet and Surgery center in Columbia, CVETS, for treatment. Make efforts and be careful to reduce these holiday hazards and you could skip a trip to the emergency vet this year!